A girl is sitting on a large grave in a cemetery, looking down. Behind her a large tree is depicted, a few tombstones, and a church. From beyond a fence bordering one side of the churchyard, a woman observes a child. Beneath the drawing a poem is written out, followed by the initials L.H.S: "I had a mother once like you/ who o’er my pillow hung/ kissed from my cheek the briny dew/ and taught my faltering tongue. / But then there came a fearful day/ I sought my mother’s bed/ till harsh hands bore me thence away/ and told me she was dead." "The Children In The Wood," to which is added "My Mother’s Grave," a pathetic story. Juvenile Books, New York, Mahlon Day, 374 Pearl Street. The Juvenile Books was a publishing house in New York. In their preface to the story "The Children in the Wood," they claim that the story was first printed in England and then reprinted many times in both England the United States. The poem following the frontispiece and preceding the story "My Mother’s Grave" was written by the American author Sigourney Lydia Howard Huntley; whether the story was originally authored by Huntley as well is difficult to verify, since the same story appears under different titles in several bibliographies. It might, however, be a version of one her numerous stories about abandoned children. And taught my faltering tongue. And told me she was dead. 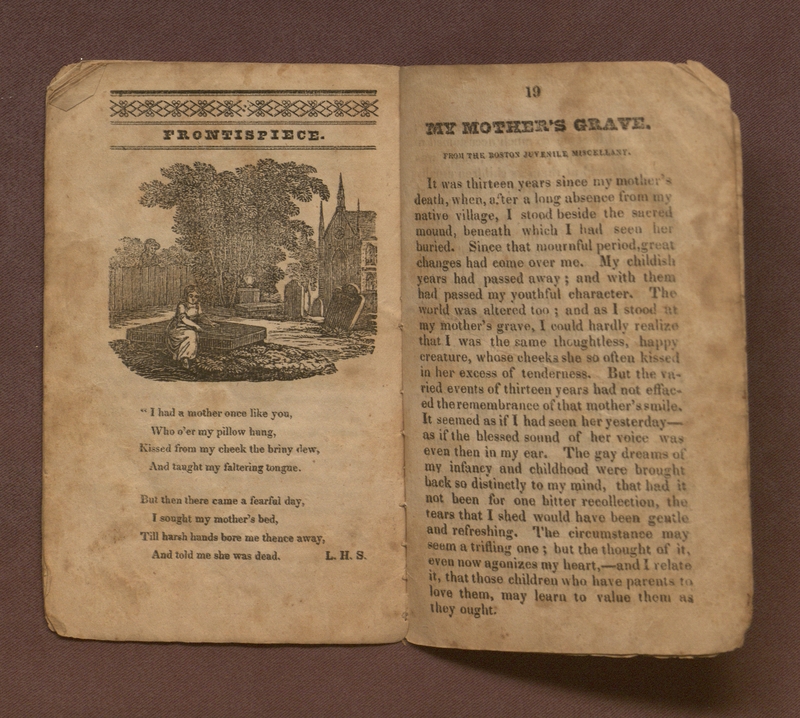 This image, a frontispiece for the children's story "My Mother's Grave," shows how the American sentimental writer Lydia Howard Huntley Sigourney uses the concept of death in children's literature. The image depicts the setting of the story. A young woman, coming home to her native village after an absence of thirteen years, tells the story of the night her mother died. As stated in the preface, "The Children in the Woods" was a popular children’s story at the time. The booklet contains two moral stories for children accompanied by several illustrations. These images include depictions of the many violent and cruel scenes in the text. James Najarian (quoting Judith Plotz, who has written on Romanticism and the evocation of childhood) points out that contemporary works by authors like Maria Edgeworth and Anna Barbauld posit the common belief (of the time) that childhood is continuous with adulthood, "not separate from it" (J. Najarian, “Romanticisms, Histories, and Romantic Cultures” 146). This statement seems to strengthen the argument of this gallery: that the theme of death was used as a marketing device by publishers. If children were treated like adults, they may have been interested in and lured by the same topics; furthermore, publishers would have been marketing children's books with adult parents in mind as well. According to Mary Louise Kete, the sentimental era was a critical moment in the emergence of American culture. "Sentimentality" was connected to the belief—originating in Thomas Paine’s 1776 essay on common sense—that all human beings react in the same way to a tragic happening, such as the loss of a child. Kete argues that this notion of sentimentality "expresses the utopian impulse to abolish boundaries and expand community upon which the ideological force of American identity depends" (M. Kete, "Sentimental Literature" 545). Kkete further argues that the works of two American authors, Lydia Huntley Sigourney and Henry Wadsworth Longfellow, had a great impact on the American culture of the nineteenth century. The consistent themes of death and abandonment in Sigourney’s work provoked feelings of sentimentality—as well as an attention to the idea of sentimentality itself—in a large American readership. These commonly provoked feelings of loss and worry were intended to encourage readers to build communities beyond the natural bonds of family; moreover, "the mode of sentiment functions to call into being an American who would be willing and able to participate in society, not flee from it" (M. Kete, "Sentimental Literature" 549). In light of the era's concern with sentimentality, this frontispiece communicates to a child audience the virtues requisite to establishing those relationships that ground a human community. Consequently, this depiction of mourning and death does not so much function as a marketing device as it contributes to the construction of a shared, American identity. Unlike story illustrations in general, which appear only rarely in contemporary fictional texts (though they may reappear slowly in an abstract form—think of W.G. Sebald’s Austerlitz, for one popular example), illustrations in children’s books have survived. Their basic function is to illustrate the plot and encourage children’s imagination. Blanck Jacob (ed. ), later volumes edited and completed by Virginia L. Smyers and Michael Winship. Kete, Mary Louise. “Sentimental Literature.” The Oxford Encyclopedia of American Literature, Vol. 3. Ed. Parini, Jay. Oxford: Oxford University Press, 2004. Najarian, James. “Romanticisms, Histories, and Romantic Cultures.” College Literature 30.3 (2003): 139-150.